Ulster will not put a date on a potential return for Jared Payne, but there may be a chance he could come back from injury during the Guinness PRO12 through the Six Nations Championship window. 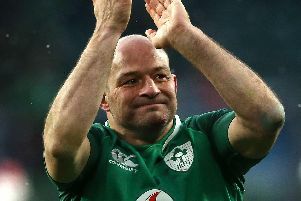 Ireland had already ruled out the Irish centre’s playing in the current Six Nations for the National team, but the News Letter revealed a month ago that the New Zealand born back had been making positive progress on a kidney and rib injury. Influential midfielder Payne suffered the knock during the November Guinness Test series against Australia. Ulster director or rugby, Les Kiss, confirmed on Tuesday Payne had been making “real positive progress” and revealed he had his first “good running session” on Tuesday. “He is still away from contact in any form. I think it is important we take that step by step. “A Coach talks about every injury each day as it comes, but it is important that we take it step by step. He seems to be in a really good place. “His first real hard hit out today on a couple of things so he is sucking the big ones in, but he is a guy who really gets fit very quickly, he does not usually lose it a lot. “He has lost a bit of weight you can imagine, but he will put that back on quickly as well.